Tomato rice is a delicious and flavourful rice that you can easily prepare and pack for lunch. It needs very few ingredients and gets done in just about 15 minutes. I pressure cook the rice and while the rice is cooking, I prepare the tomato gravy to be mixed with the rice. 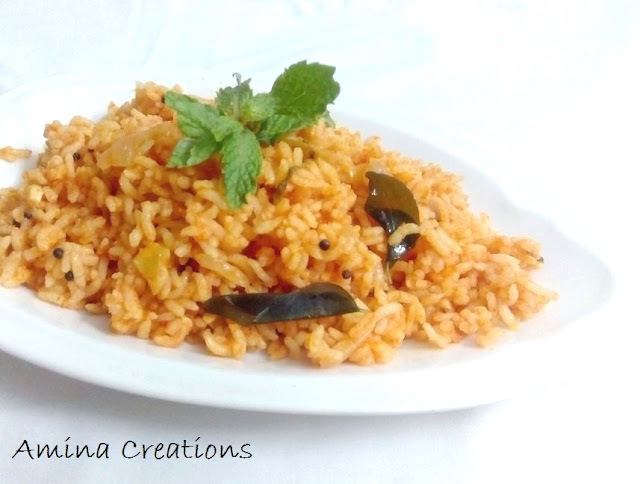 You can have tomato rice as it is or can serve with any poriyal or side dish of your choice. 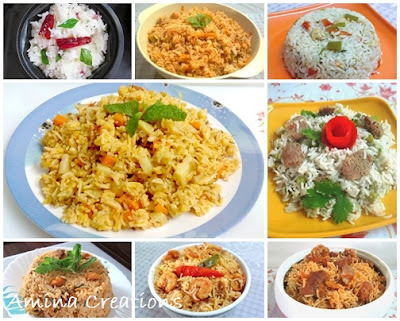 Tomato rice also tastes great with mango or garlic pickle. while the rice is getting cooked, heat oil in a pan and add mustard seeds. When the seeds start sputtering, add onions and curry leaves. Saute till the raw smell goes and red chilli powder and salt. Add tomato puree and cashew nuts now and cook for a few minutes till oil starts separating and the raw smell of tomato goes. Add 1/2 or 1 cup water and bring to a boil. Now add the cooked rice, coriander and mint leaves and mix well. Check for taste, add salt if necessary. Reduce heat, close a lid and allow the rice to blend well with the masalas for 2 to 3 minutes. Transfer to a serving plate and garnish with mint leaves.